Today we consider the causes of mass unemployment of the sort that most nations are enduring at present. This also involves the consideration of the relationship between wages and employment. This is an area in economics that has been hotly contested across paradigm lines for years. Mainstream economic commentators still claim that the employment situation can be improved if wages are cut. They are wrong. Modern monetary theory (MMT) is clear – mass unemployment arises when the budget deficit is too low. To reduce unemployment you have to increase aggregate demand. If private spending growth declines then net public spending has to fill the gap. In engaging this debate, we also have to be careful about using experience in one sector to make generalisations about the overall macroeconomic outcomes that might accompany a policy change. To understand the position that modern monetary theory (MMT) takes on this issue, we can start with an incredibly simple economy which is populated by two people, one being government and the other is the private (non-government) sector. Suspend your prejudices for a little while and just go with the flow in this economy. The government is the monopoly issuer of the fiat currency which it also demands as payments in tax. It uses its spending to move private activity into the public sector (to pursue its socio-economic goals). All spending and taxation is done electronically via computers. If the government runs a balanced budget (spends 100 dollars and taxes 100 dollars) then private accumulation of fiat currency (savings) is zero in that period and the private budget is also balanced. Say the government spends $120 and taxes remain at $100, then private saving is $20 which can accumulate as financial assets. The corresponding $20 was issued by the government to cover its additional expenses. The government may decide to issue an interest-bearing bond to encourage saving but operationally it does not have to do this to finance its deficit. The government deficit of $20 is exactly the private savings of $20. Now if government continued in this vein, accumulated private savings would equal the cumulative budget deficits. However, should government decide to run a surplus (say spend $80 and tax $100) then the private (non-government) sector would owe the government a net tax payment of $20 and would need to sell something back to the government to get the needed funds. The result is the government generally buys back some bonds it had previously sold. Either way accumulated private saving is reduced dollar-for-dollar when there is a government surplus. The government surplus has two negative effects for the private sector: (a) the stock of financial assets (money or bonds) held by the private sector, which represents its wealth, falls; and (b) private disposable income also falls in line with the net taxation impost. Some may retort that government bond purchases provide the private wealth-holder with cash. That is true but the liquidation of wealth is driven by the shortage of cash in the private sector arising from tax demands exceeding income. The cash from the bond sales pays the Government’s net tax bill. The result is exactly the same when expanding this example by allowing for private income generation, a banking sector and diversifying the non-government sector into a foreign and domestic sector. So with that accounting clear we can see what MMT says about mass unemployment, of the type that we are seeing around the World now and which we also saw during the Great Depression. MMT tells us that state money introduces the possibility of unemployment. There is no unemployment in non-monetary economies. From our simple example, it is clear that the person who is the government does not have to raise taxes or issue a financial asset (bond) in order to spend. So the government in a fiat monetary system is not “revenue-constrained”. Intuitively this is hard to accept because we are so wedded to the idea that nothing is certain but death and taxes and that the latter is to raise money for governments to spend. The issue of taxation is also very emotional – as we see in some comments on my blog – taxation is linked by conservatives to concepts of slavery; loss of freedom; etc. So the idea of a government that is not revenue-constrained is hard to grasp at the emotional level. What this all means is that we have to analyse the functions of taxation in a different light. As a background to this discussion you might like to read this blog – Functional finance and modern monetary theory . The mainstream economists conceive of taxation as providing revenue to the government which it requires in order to spend. In fact, the reverse is the truth. So in our 2 person economy, the government person would be able to purchase labour from the non-government person as long as the tax regime was legally enforceable. The non-government person will also accept the government money because it is the means to get the $s necessary to pay the taxes due. So we are now seeing that at a macroeconomic level, manipulating wage levels (or rates of growth) would not seem to be an effective strategy to solve mass unemployment. I will return to this soon. Further, for a time, what may appear to be inadequate levels of net government spending can continue without rising unemployment. In these situations, as is evidenced in countries like the US and Australia over the last several years, GDP growth can be driven by an expansion in private debt. The problem with this strategy is that when the debt service levels reach some threshold percentage of income, the private sector will “run out of borrowing capacity” as incomes limit debt service. This tends to restructure their balance sheets to make them less precarious and as a consequence the aggregate demand from debt expansion slows and the economy falters. In this case, any fiscal drag (inadequate levels of net spending) begins to manifest as unemployment. The point is that for a given tax structure, if people want to work but do not want to continue consuming (and going further into debt) at the previous rate, then the Government can increase spending and purchase goods and services and full employment is maintained. The alternative is unemployment and a recessed economy. The debate about the role of wage cuts in stimulating employment was well rehearsed in the famous Keynes versus the Classic debate during the Great Depression. The debate was multi-dimensioned but the role of wage flexibility was a key aspect. In the classical model of employment determination which is the basis (still) of the typical mainstream textbook analysis, cuts in the nominal wage will increase employment. In the General Theory, Keynes questioned whether wage reductions could be readily achieved and was skeptical that, even if they could, employment would rise. The adverse consequences for the effective demand for output were his principal concern. The mainstream model assumes that economies produce under the constraint of the so-called diminishing marginal product of labor. So adding an extra worker will reduce productivity because they assume capital is fixed in the short-run. This assertion which does not stack up in the real world, yields the downward sloping marginal product of labor schedule in the textbook model. Then profit maximising firms set the marginal product (the contribution of the last worker to production) equal to the real wage to determine their employment decisions. Labour demand is thus inverse to the real wage. As the real wage rises, employment falls in this model. So workers hate work and enjoy surfing. They will only go to work to get an income and the higher the real wage the more work they will supply. Again, this conception is arbitrary and not consistent with countless empirical studies which show the total labour supply is more or less invariant to movements in the real wage. Other more complex variations of the mainstream model depict labor supply functions with both non-zero real wage elasticities and, consistent with recent real business cycle analysis, sensitivity to the real interest rate. All ridiculous. In the mainstream model, labour market clearing thus means that the real wage equals the marginal product of labour. The real wage will change to ensure that this is maintained at all times thus providing the classical model with continuous full employment. So anything that prevents this from happening (government regulations) will create unemployment. The equilibrium employment levels thus determine via the technological state of the economy (productivity function) the equilibrium (or full employment) level of aggregate supply of real output. It was of particular significance for Keynes that the classical explanation for real output determination does not depend on the demand for it at all. Keynes proposed the revolutionary idea that employment was determined by effective monetary demand for output. Since there was no reason why the total demand for output would necessarily correspond to full employment, involuntary unemployment was likely. Keynes revived (although unknowingly) Marx’s earlier works on effective demand. What determined effective demand? There were two major elements: the consumption demand of households, and the investment demands of business. Keynes also argued that in a recession, the real wage might not fall. But it should be clear that the problem is not that this real wage is too high, but rather that the prices are too low (as prices fall with lower production). Workers, Keynes pointed out, bargain for money or nominal wages, not real wages. The act of dropping money wages across the board would also reduce aggregate demand and prices would also fall. So there was no guarantee that real wages (the ratio of wages to prices) would therefore fall. They may rise or stay about the same. Falling prices might, however, depress business profit expectations and so cut into demand for investment. This would actually reduce the demand for workers and prevent total employment from rising. The system interacts with itself, and an equilibrium of full employment cannot be achieved within the labor market. However, in Keynes’ analysis, attempting to cut real wages by cutting nominal wages would be resisted by the workers because they will not promote higher employment or output and also would imperil their abiltiy to service their nominal contractual commitments (like mortgages). The argument is that workers will tolerate a fall in real wages brought about by prices rising faster than nominal wages because, within limits, they can still pay their nominal contractual obligations (by cutting back on other expenditure). A more subtle point argued by Keynes is that wage cut resistence may be beneficial because of the distribution of income implications. If real wages fall, the share of real output claimed by the owners of capital (or non-labor fixed inputs) rises. Assuming such ownership is concentrated in a few hands, capitalists can be expected to have a higher propensity to save than the working class. It should be clear now that MMT integrates the insights of Keynes and others into a broader monetary framework. But the essential point is that mass unemployment is a macroeconomic phenomenon and trying to manipulate wage levels (relative to prices) will only change output and employment at the macroeocomic level if changes in demand are achieved as saving desires of the non-government sector respond. There are those who would deny that mass unemployment is due to inadequate aggregate demand and instead reassert the neo-classical view that unemployment arises as a result of excessive real wages (too high for marginal productivity – that is, the productivity of the last worker employed). The US share market boomed through the 1920s and share prices went way beyond the fundamentals of the companies they were reflecting. The market peaked in September 1929 but in 1928 and 1929 the Federal Reserve, concerned with the asset price bubble, put up interest rates. While the Austrian school and Friedman and Schwartz blamed the crash on lax monetary policy the reality is that the central bank was contracting the economy prior to the crash in October 1929. At the time of the crash, the US government did nothing because it was dominated by those who believed the markets would self-regulate via wage and price adjustments. During the descent into depression which saw unemployment rise to 25 per cent, there were no attempts by the federal government to stimulate aggregate demand. Further, the Federal Reserve actually sold bonds to push up interest rates in a mindless effort to stem the gold outflows that we occurring as the rest of the world lost confidence in the US economy. The terminology of the day was that the private markets would “liquidate the economy” (that is, clean out the unproductive parts). Fantastic fears of inflation were expressed. That was to cry, Fire, Fire in Noah’s Flood … It is after depression and unemployment have subsided that inflation becomes dangerous. Anyway, that is background. Some readers have proposed that work by Stephen Silver and Scott Sumner (1995) ‘Nominal and Real Wage Cyclicality During the Interwar Period’, Southern Economic Journal, 61(3), 588-601, provides proof that wage rises caused unemployment during the Great Depression. Sumner has a PhD from Chicago so that concentrates the mind on what sort of analysis he will be pursuing. This paper is actually not directly about the real wages cause unemployment but is rather more about decomposing the cyclical movements in prices and nominal wages. But the overall intent is to establish the notion that FDRs “high wage” approach damaged the US economy. Sumner draws on the research paper in this blog which is explicitly about FDRs high wage policy. He provides this table which he claims supports the proposition that high wages damaged the US economy in the 1930s. I’m going to go out on a limb and argue that no respected macroeconomic theory has ever been so decisively refuted by the data as the theory that high wage policies can actually help the economy during a Depression. I love it when conservative economists go out on a limb because it occurs so rarely that they subject their views to empirical scrutiny – that is, allow some empirical analysis to sort the issue out. So I thought I might do some checking. In this study we have relied solely on monthly data, since many of the wage and price shocks appear to have been of extremely short duration. The output series we used is industrial production as estimated by the Federal Reserve Board. 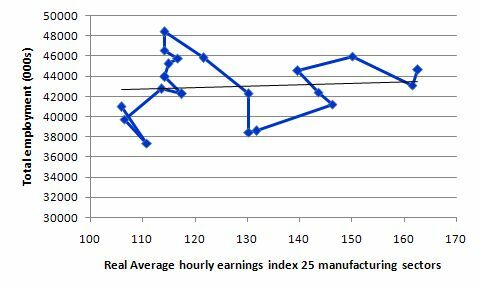 For our nominal wage series we used average hourly wages in manufacturing. (See the appendix for a description of data sources.) Although these series offer a somewhat restricted view of the aggregate economy, this emphasis would not seem unwarranted for a study focusing on the business cycle. So first they are trying to capture the macro dynamics during the Great Depression by focusing on one sector – industrial production. Keep in mind the fallacy of composition argument noted above! That is, you cannot generalise from a sector what might happen at the aggregate (macroeconomic) level. During the 1920s there was a negative and highly significant relationship between DY and DRW, and that relationship became even stronger during the 1930s. Diagnostic tests show no evidence of serial correlation. I have exactly the same data as them and ran the same regressions and get similar results. So that is not an issue. But lets see what the issues are. You can get historical statistics from the US Census Bureau. The NBER Macrohistory archive is also a good place to get this sort of data. There you can get series m08142U.S. Average Hourly Earnings, Twenty-Five Manufacturing Industries, National Industrial Conference Board 01/1920-07/1948 and series m08061cU.S. 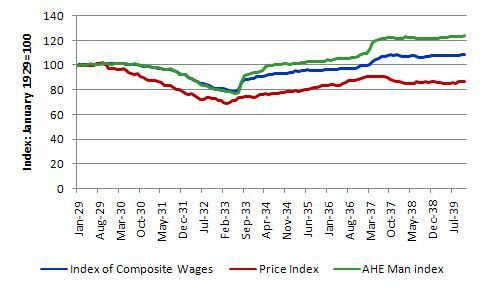 Index of Composite Wages 01/1919-07/194. What did happen to US prices and wages during the Great Depression? The following shows the Index of Composite Wages, the general price level index and the Average Hourly Earnings, Twenty-Five Manufacturing Industries (January 1929 = 100). It is very noticeable that as output generation collapsed in the face of the US federal government’s fiscal inaction and central bank interest rate hikes, the general price level fell faster than the money wage level (both measures). This had the strange result of generating a counter-cyclical real wage. The counter-cyclical nature of the real wage is shown in this chart (with the vertical blue lines more or less coinciding with Sumner’s wage shock months). The important point is that real wages (both measures) were rising from the outset of the recession not because of nominal wage push but because the general depressed nature of the economy was deflating prices faster than wages. This fact highlights one of the major arguments used by Keynes against trying to use nominal wage cuts to reduce the real wage. The real wage is a composite of the nominal wage determined in the labour market and the price level determined in the goods market. You cannot reliably engineer a cut in the real wage by cutting the nominal wage that workers receive in the labour market. What happened to industrial production? 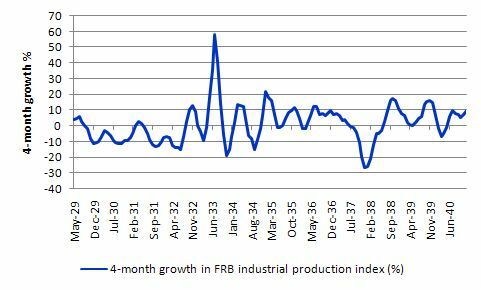 The following graph plots the FRB index of industrial production as 4-month growth rates (to coincide with Sumner’s Table). While Sumner wants to highlight negative growth periods that follow wage adjustments as per his table above, the reality is that industrial production according to the FRB index was highly volatile over the entire period. There is nothing special in timing or magnitude of the swings between the periods that Sumner chooses to concentrate on and several other periods. There were regular periods during the Great Depression which were clearly unconnected with the FDR wage policy changes where industrial production plunged for several months after reaching a local peak. I would note that the 4-month growth construct that Sumner uses in his table is totally arbitrary. You also get quite different results if you measure the growth in the variables over different time horizons. In general, robust empirical results should be insensitive to these sorts of variations. There is nothing in economic theory that would lead one to choose a 4-month growth horizon over some other horizons. In these cases, you cannot help feeling that the arbitrary choice is designed to get the results you were looking for. This leads to another major issue in doing this sort of research – the data is less than reliable and there are usually choices available about which measure you might employ. You can get quite different results using different time series which purport to describe the same variable. There is an industry among historical researchers in creating new datasets from scant sources based on different assumptions etc. To demonstrate why this matters I compared regression results using the FRB IP series (as in Silver and Sumner, 1995) and a more recently compiled industrial production series compiled by Jeffrey Miron and Christina Romer in 1989 – see Description – Original article with data. It is a longer dataset than the FRB series. 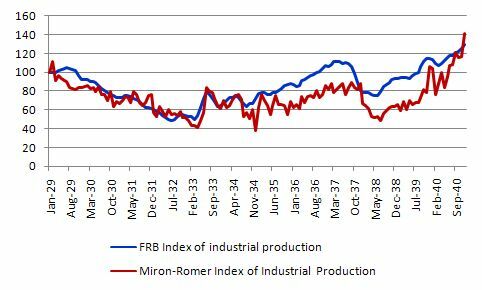 The FRB and Miron-Romer industrial production data is available from HERE and it is accompanied by a description. The following graph shows the level of the the two indexes of US industrial production (I rebased them to January 1929 = 100). It is clear that there is considerable variation in the two depictions of industrial activity. Anyway, replicating the Silver-Sumner regressions (1995, Table 1) noted above using the Miron-Romer IP data in place of the FRB data changes things considerably. I failed to find any statistically significant relationship between the change in log of real hourly earnings and the change in the log of industrial production (that is, the same specification as Silver-Sumner used – just a different measure of industrial production). No matter how hard I tried! So the first thing you learn from applied econometric studies is that the results are often very sensitive to the data used, the sample period that you use to model the data and the way in which you construct the model (the so-called parameterisation). Fig. 2 shows little relationship between changes in manufacturing production and changes in manufacturing real product wages across countries over the downturn period from 1929 to 1932. Least squares regression suggests that there is not a statistically significant relationship between the change in real wages and the change in industrial production over the period 1929–1932, as shown in the first column of Table 1, regardless of whether wages are deflated by the value-added price deflator or wholesale prices. Moreover, just concentrating on the FRB Industrial Production series, also raises questions. What happened to employment in the industrial sectors? Between 1933 and 1940, the proportion of both in total employment steadily grew again. So the really large declines in employment in these sectors (which comprise industrial production) happened before FDR began his “high wage” strategy (US Census Bureau data). But to appreciate the argument presented in the first part of this blog you have to differentiate between a sector and the overall economy. MMT is a macroeconomic theory. Sumner chooses to concentrate on one sector only. Don’t forget that the danger of fallacy of composition is lurking in this sort of analysis. 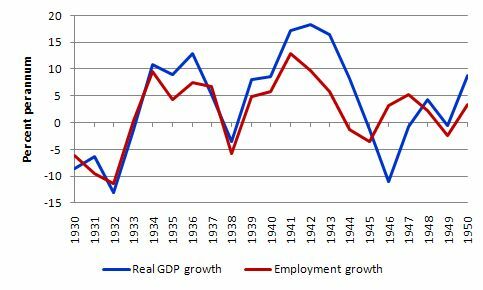 The next graph shows the annualised US GDP and total employment growth (per cent per annum) for the period 1930 to 1950. The relationship holds over all periods. Total employment is largely driven by changes in aggregate income (GDP) and you can see that the period of FDR interventions stimulate both. You can also see that the early period of “liquification” (waiting for the markets to work) prior to 1933 caused sharp contractions in both, as did the period around 1937 when FDR was spooked by his conservative advisors and contracted fiscal policy. 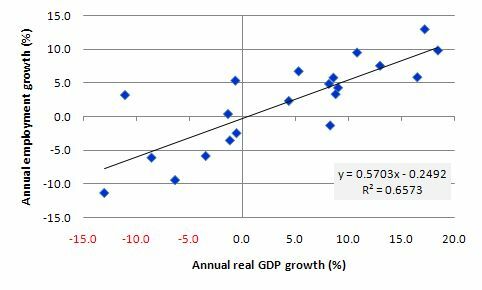 To see the relationship in a different light here is a scatter plot with annual growth in real GDP on the horizontal axis and annual growth in total employment on the vertical axis over the same period as the preceding graph. The relationship is very strong (for a growth comparison) and the regression indicates that real output growth drives employment growth (as you would expect). Finally, the last graph shows the relationship between US total employment (vertical axis) and Real Average Hourly Earnings (Twenty-Five Manufacturing Industries, National Industrial Conference Board) for the period 1920 to 1939. The same sort of chart would be produced if I used the general wage measure noted above. The straight line is a simple regression line which is definitely not negatively sloping. What is the overall relationship shown? None! It is hard to mount a case that FDR wage improvements during the Great Depression were damaging to overall economic growth and total employment growth. Even if some sectors were disadvantaged (and that isn’t proven) the evidence is clear that the rises in real wages were associated with rising overall employment. At the CofFEE Conference, one of the points that Marshall Auerbach made in his presentation was the official US data never counted the relief work participants among the employed, which had the effect of understating the contribution of the New Deal. The original source of this finding was Michael R. Darby (1976) ‘Three-and-a-Half Million U.S. Employees Have Been Mislaid: Or, an Explanation of Unemployment, 1934-1941’, Journal of Political Economy, 84(1), 1-16. Darby had studied the writings of Stanley Lebergott (1964) Manpower in Economic Growth: The American Record since 1800, New York, McGraw-Hill. He had constructed early data from the Great Depression. See also Weir, D.R. (1992) ‘A Century of U.S. Unemployment, 1890-1990: Revised Estimates and Evidence for Stabilization’, Research in Economic History, 14, 301-346. These estimates for the years prior to 1940 are intended to measure the number of persons who are totally unemployed, having no work at all. For the 1930’s this concept, however, does include one large group of persons who had both work and income from work – those on emergency work. In the United States we are concerned with measuring lack of regular work and do not minimize the total by excluding persons with made work or emergency jobs. This contrasts sharply, for example, with the German practice during the 1930’s when persons in the labor-force camps were classed as employed, and Soviet practice which includes employment in labor camps, if it includes it at all, as employment. I was sent some data overnight from a colleague Phil Harvey (via Marshall) who has also studied the Great Depression in some detail. Phil is at Rutgers in the US and also gave a presentation at the CofFEE Conference this year. 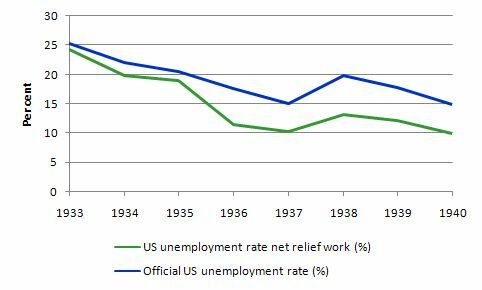 The following graph shows the official unemployment rate for the US between 1933 and 1940 alongside the unemployment rate once you net out the relief work that was provided. … understate the effect of the New Deal job creation measures … because they don’t show how much of the decline in official employment was attributable to the multiplier effect of spending on direct job creation. Also, the “work relief” category does not include employment on public works funded by the Public Works Administration (PWA) nor the multiplier effect of PWA spending. The figures tell the story indirectly, however, in the path official unemployment followed – steeply declining in periods when work relief spending was high and either declining more slowly or increasing in periods when work relief spending was cut back. That should give you no doubt that the Great Depression was a disaster but that the FDR’s New Deal (including the high wage policies) attenuated the disaster. The data also should lead you to reject outright the claims that the interventions made things worse. I’m interested in your response to this guys interpretation of the Argentinian crisis and his comments about Chinese bond purchases. Greg, gjohnsit is a long-time economics blogger at Kos. He doesn’t understand MMT and is one of the “progressives” that thinks taxpayers fund government spending. It’s based on the-government-is-running-out-of money meme. He’s comparing Argentina to the US, when the situations are far different. But he is correct in saying that the same big banks have taken both countries for a ride over the cliff. He is claiming that the US government (and Fed) has it’s eye on retirement accounts to fund the massive Treasury issues he sees coming, as Chinese demand for Tsy’s dries up. (On one hand, some people are worried that Chinese demand for Tsy’s will dry up, bankrupting the US, and on the other hand, others are worried that the Chinese will own the US.) His evidence is that money market accounts will now longer function as demand accounts but time accounts, driving people into Tsy’s. Huh? Many others (Zero Hedge) are fretting instead that the government will drive equities down to supply funds for Tsy purchases. Others are concerned that the Fed will just monetize the debt by creating reserves to fund Tsy purchases, which they claim will soon lead to hyperinflation. Etc. This is pretty standard talk on left and right now, and you find it on Kos, Huffington Post and other influential progressive sites in addition to the usual suspects on the right. Some are worried that he US will become another Zimbabwe, and others are worried that the US will default like Argentina did. Oh, and FEMA already has the concentration camps ready for when unrest gets out of hand. It all sounds way too conspiratorial to me, and more than a few are demagoging it. I regularly get frantic questions from friends, “What should I do now that …. is happening?” My concern is that the “fiscal responsibility” meme is gong to lead to a repeat of 1937 instead. Thanks for your response Tom. I definitely recognized the debt terrorist memes being espoused and from my weeks here at billy blog could tell he didnt understand MMT. It does seem like the Glen Beck hysteria is spilling over to the left flank as well. I think what is appealing about MMT is the coherence of it. As you point out, the deficit terrorists cant seem to settle on the form of Armageddon we are in store for. You seem to think there is not a reason to be concerned about the 401K reforms being floated around. Is that accurate? I do not remember the 2007 reforms he mentioned. I agree that we are much more at risk of not doing near enough and seeing even more unemployment and deflation next year. Greg, I’d be a lot more worried about the US planning to default on its obligations to Social Security than what in store for 401K’s. I’d also be more worried about having the bottom fall out of equities, too, as the Fed winds down QE. Dean Baker is sounding the alarm that the Peterson crew are gunning for SS for real. Baker is a respected economist, one of the few that predicted the financial crisis. “Does Congress Want to Default on the National Debt?” Baker is not given to conspiracy theories, and the administration has indicated that is planning to make cuts to the “unfunded obligations.” I am no longer so sure that this is ignorance and not disingenuousness. It would be grabbing the third rail of American politics though. Bill, this is really a great post, and it will be very helpful in talking about MMT. Your two person model of a state monetary economy fleshes out the simple business card explanation nicely. Thank you very much for this explanation of the causes of mass unemployment. I greatly appreciate your taking the time to address some of the questions I posed in an earlier post. Your presentation of the evidence showing that mass unemployment is the result of falling AD caused by insufficient government spending rather than overly generous real wages is a true tour de force. I have printed out this blog post and over the next few days I will be looking through some of your suggested readings linked to in this piece. I’m sure I will have questions that I hope contributors to the comments section will be able to address. For now I would just like to pose one short query related to the MMT perspective on micro-economics and the labor market. Specifically what I’d like to know is if there is any place at all in MMT for a micro-economic analysis of a firm’s decision to hire and fire workers? If so, what would that analysis look like? Would the Marginal Productivity of Labor actually increase in the short run even if capital costs were fixed? Would fewer workers offer their services as wages increase? Maybe it’s just years of brainwashing, but the standard micro-economic model of a downward slopping demand curve and an upward sloping supply curve for labor seems to make intuitive sense to me. I do understand the Keynesian macro-economic argument that employment levels are determined not by comparing the marginal productivity and cost of individual workers, but by the demand for the goods and services firms produce, but I guess I never really saw these two positions as fundamentally contradictory. I know a lot of work has gone into trying to establish a “micro-foundation,” for macro-economics. Does MMT consider this to be a waste of time? Tom, does that Peterson have any relationship to the Peterson Institute Simon Johnson is a part of or is it just coincidence they have the same name? Also, how do you embed a link in a comment like you did to that Huffington Post article? Marginal productivity is important when you have insufficient demand which leads to marginal supply effects. As long as demand fully matches supply (with or without government help) why should you care about marginal productivity? Tom, I’m worried as hell about the SS situation. I’ve had my 401K out of equities for a year and a half and have no intention of returning any time soon. All this looks eerily similar to our last “great” financial crisis of the 30s. We have really not learned a thing have we? All these students of the great depression like Bernanke have truly wasted their education. Same guy. These are the wealthy conservatives folks who are working to finally end the New Deal with the “fiscal responsibility” meme, eliminating all social spending and cutting taxes on all revenue except wage income. This is where “the death tax” meme comes from, as well as the push to eliminate the capital gains tax and the corporate income tax, too, not to mention union busting. Their financial backing has propagandized the “fiscal responsibility” (“debt is bad”) and “individual responsibility” (“It’s every man for himself”) memes and made them dominant in the political universe of discourse. Now, to be taken seriously, one has to mouth this stuff. Everyone who is not either a deficit hawk or a deficit dove comes across as “irresponsible” because of it. Here’s a page that shows how to do it. I think getting people to understand MMT is not so much about dispelling myths and removing ignorance at a nuts and bolts level. The obstacles are political and there are opponents with much to lose. I have added a postscript to this post which provides even more evidence that FDR interventions were beneficial. You can read the additional material at the end of the main body of text above. Such a government is very easy to grasp. Think USSR. Didn’t the USSR use a single-entry accounting system, and when the oil price declined they couldn’t get hold of dollars to earn foreign exchange income. Bill, I don’t think you’ve supported your claim convincingly. Your toy economy has everyone working for the government, but real economies are different. In a pre-fiat economy, paid employment occurs due to improved division-of-labour efficiencies requiring larger organization beyond the limits of bartering, with whatever currency is convenient (eg gold or private scrip). If we introduce a government which taxes and spends fiat money, that does not change the nature of the private sector employment system except that people have fewer personal assets from taxation but hopefully better infrastructure from the spending. Some people will be employed directly by government as well. If there is less spending than taxation, then government money will become scarce and there will be tax defaults. If government money is the only viable currency then there may be a currency crisis and a resurgence of bartering or unofficial currencies ,but I don’t see why private employers should start laying off employees if the real economy is functioning. Ex-government employees may need to find new work in the private sector. With a perfectly liquid currency all employees would find themselves unable to pay their taxes at the same moment and there would be simultaneous nationwide tax default/revolt, but all private workers would still be employed. There are many possible causes of high unemployment including volatility in the supply of raw materials or energy, technological obsolescence of industry sectors, and wage-arbitrage between countries or regions. You haven’t demonstrated that government spending is more significant than other possible causes. Govt. spending is the cure for a multiplicity of causes. SMOB:What if the economy in which unemployment is high has not the productive capacity to meet the demand for what the people wish to consume from goods and services? By assumption, a high unemployment economy always has a free-lunch way of increasing productive capacity to better meet consumption demand – employ the unemployed. Forcing people to not work is not a way to produce more. Only when speaking of national economies does anyone utter the astounding contrary idea. What if in that very same economy, the government, for the sake of social stability, increase government jobs with above average wage and demand very little productivity in return, then turns around and penalizes the private sector for not hiring nationals? That is a bad idea. Do not do this. Nobody says MMT prevents states or people from doing all stupid things. It just advises against doing some particular stupid things like creating unemployment, inflation, financialization, gross inequality etc.